Minimally invasive surgery (MIS), also known as videolaparoscopic or just laparoscopic surgery, is a surgical philosophy that calls for performing the most advanced operations through the least invasive incisions. 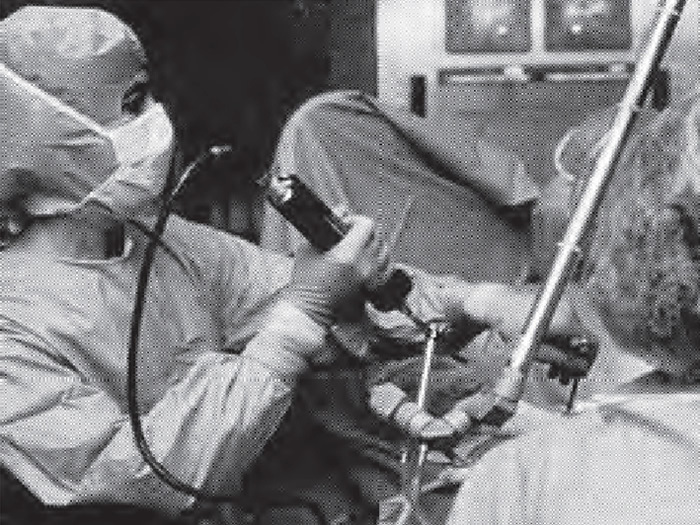 Although countless attempts were made throughout history to limit the use of invasive procedures, it was only after the introduction of videolaparoscopy by Dr. Camran Nezhat in the late 1970s and early 1980s that it became possible to perform advanced operations through tiny port holes instead of through large incisions. Videolaparoscopy (also called keyhole or Band-Aid surgery) is a surgical technique in which surgery is performed using special video cameras and light sources which are attached to the end of a long, thin (3-11mm thick) telescope-like tube called a laparoscope (also endoscope). To improve visualization and access to the organs, videolaparoscopy also requires that the abdominal cavity (belly) be inflated (distended) with carbon dioxide gas (CO2). This distention allows the laparoscope to be safely inserted through the belly button and into the abdominal cavity. One to three additional 5-10mm incisions are also made in the lower abdomen for inserting auxiliary instruments. These instruments are essentially extensions of the surgeon’s hands, allowing him or her to use them from outside of the body to perform surgery inside the abdominal cavity. Instead of looking down at the patient, the surgeon is now able to watch the TV monitor and perform advanced laparoscopic surgeries off the monitor with excellent magnified visualization, while assuming a comfortable standing posture and with the least trauma to patients. The surgical team can also follow the entire surgery by watching the TV monitors as well. Today laparoscopic surgery has many applications, including the treatment of ovarian cysts, tubal reversal, endometriosis, infertility, management of fibroids, and hysterectomy. It also has an increasing role in gynecologic oncology. Prior to the advent of videolaparoscopy, all surgeries were performed using very large incisions. These large incisions were significantly more painful for patients, requiring several weeks of recovering, often involving several days of sedation with morphine and complete immobility in the hospital. Compared to minimally invasive surgery, large incision surgeries (laparotomy, thoracotomy, etc) are also associated with a greater risk of serious injury, infection, wound dehiscence, long-term disability, and higher incidences of mortality. 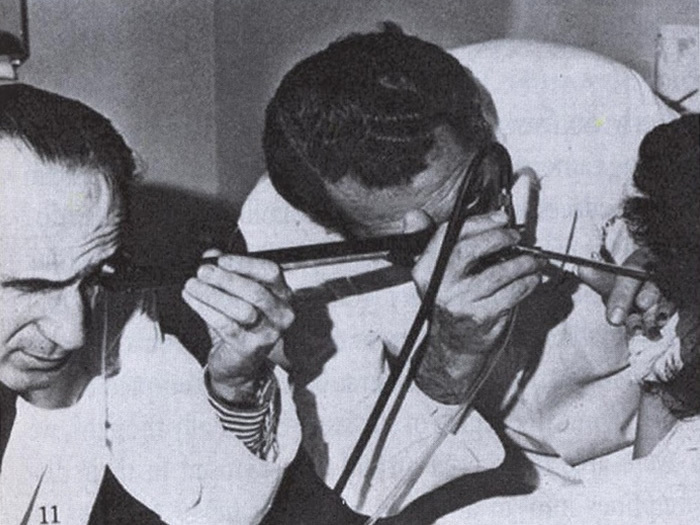 Because videolaparoscopy led to such a substantial reduction in these adverse outcomes, it has revolutionized modern-day surgery in every discipline and is now recognized as one of the most important surgical innovations of the 20th century. Dr. Camran Nezhat performing videolaparoscopy, circa 1980, and a few years later in the early 1980s. 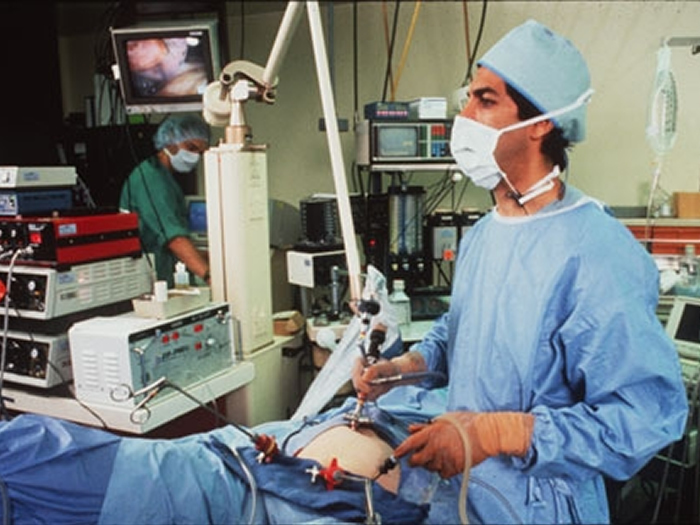 Prior to videolaparoscopy, the old method of performing laparoscopy required that doctors bend over and peer through the laparoscope’s eyepiece, as is shown in the picture on the left from the late 1970s and a reenactment on the right. Because of this awkward positioning, laparoscopy’s utility was limited to diagnostics and a few very minor procedures. Pictured above is a side-by-side comparison, showing on the left a large abdominal incision held together by staples from traditional open surgery (laparotomy) and the tiny port holes used in minimally invasive surgery showing on the right. Reproduced with permission of Science Photo Library. More examples of the large incisions and large scars made in traditional open surgery. LAPAROSCOPY MYTHS: There are many misconceptions among doctors and patients concerning laparoscopy, the most common of which are discussed HERE. 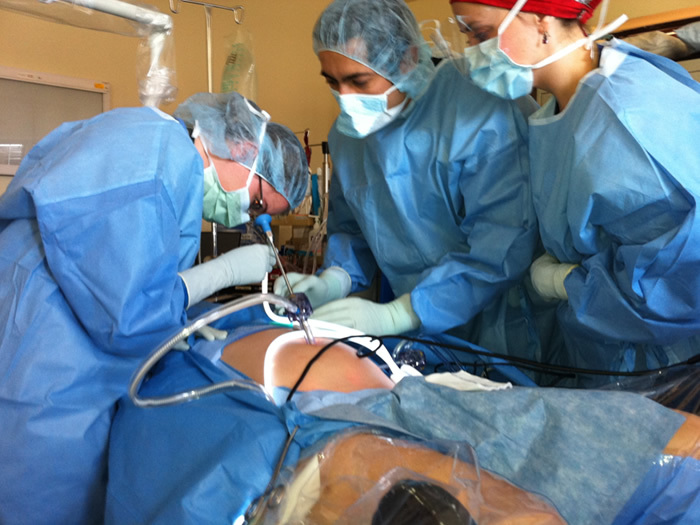 Minimally Invasive Surgery /Videolaparoscopic/Laparoscopic Surgery.